In August and September 2006, New Zealand was hit with the largest and most prominent industrial dispute experienced in the country for several years, when over 500 supermarket distribution centre workers were locked out for close to a month. Anarchists were involved in the nationwide campaign in support of the workers in a variety of ways. In August 2006, a 48 hour strike was called by over 500 unionised workers, members of the National Distribution Union (NDU), at Progressive Enterprises distribution centres in Auckland, Palmerston North and Christchurch, as a part of their effort to get a national contract, pay parity between the three centres and a pay rise (of differing percentage at each site). The distribution centres supplied much of the merchandise to Progressive owned supermarkets (including the Woolworths, Countdown, Foodtown and SuperValue brands) across New Zealand. The next day, August 26th, Progressive announced that it was locking out the workers indefinitely. The lockout continued for almost a month, finally ending on September 21st with an agreement for pay parity and a 4.5% pay rise. Throughout the lockout, there were extensive solidarity actions and fundraising across New Zealand and Australia. While I will give a brief overview of these, the main purpose of this article is to focus on the activity of anarchists in New Zealand, and to examine some of the ways anarchists interacted with rank and file Progressive employees and union officials during the lockout. Questions will be raised about some of the issues with supporting struggles from the outside, whose voices get listened to during an industrial dispute, and how to maintain ongoing contact with workers after industrial action has died down. Of foremost importance were the picket lines. At all three distribution centres, Progressive workers and supporters held picket lines around the clock for the entirety of the lockout. In Auckland and Christchurch, picket lines held strong and more or less completely stopped trucks entering or leaving. The picket line in Palmerston North, which had highest wages prior to the lockout, was less effective, with almost half of the 93 union members at the site scabbing on their workmates, leading to the distribution centre remaining open, although not at full functionality. To get around the picket lines, Progressive also set up a number of makeshift distribution centres stocked with shipping containers in underground and aboveground car parks at their supermarkets. Some non-union temp workers hired by Progressive in Auckland quit their jobs after discussions with the locked-out workers. Across the country, Linfox were hired by Progressive to use their trucks to continue distribution from the makeshift centres. After some initial confrontations on picket lines in Auckland, including one on September 8 in which a Linfox driver swung a metal pole out his window at picketers in an incident which saw 10 picketers (including Progressive employees and union officials) arrested by police, Linfox drivers agreed not to cross any picket lines. This agreement did not extend to the rest of the country however, and did not stop Linfox drivers in Auckland making deliveries where picket lines did not exist. As well as the permanent picket lines at the three distribution centres, flying pickets were held at a number of the makeshift distribution centres in a number of different cities. These were sometimes done by a mix of Progressive employees and their supporters, and sometimes entirely by supporters. The flying pickets had a wide variety of effectiveness, sometimes managing to stop trucks entirely while other times they did not have the numbers (or the willingness/ability of picketers to risk arrest) to do so. In an effort to impede work at some of the makeshift distribution centres, some illegal activity was also undertaken. On several occasions padlocks holding the shipping containers shut had their keyholes glued shut. However, this most likely was only a minor inconvenience at best, as all that it required to fix was something to cut the padlock off and a new padlock purchased. An extensive informational campaign was also held at Progressive supermarkets around the country. These would generally consist of 2 – 10 people standing outside the supermarket doors, with collection buckets and leaflets (produced and printed in huge numbers by the NDU). Often the supporters would encourage shoppers to boycott Progressive supermarkets until the lockout was withdrawn and the workers demands were met. Anecdotal evidence exists of a number of people respecting the boycott request and shopping elsewhere, although the NDU itself never actually called for a boycott. Often the leaflets were also taken inside the store and placed on shelves, especially as the lockout progressed and more and more stores ran out of stock and had empty shelves, perfect for leaflets to be put on. At the time, checkout staff (many also NDU members) were nearing negotiations for their own contract, and again, anecdotal evidence exists of checkout and security staff willingly turning a blind eye to leafleting and other activities inside supermarkets in a show of support for distribution centre staff. Rallies and marches were undertaken in several centres by the workers and their supporters. In Palmerston North, over 200 attended a rally at the distribution centre on September 16th, which included a creative display of solidarity by the Postal Workers Union, who erected a mailbox amongst the tents used by picketers, and promised to deliver letters of support addressed to “Camp Union, Lockout Island, Corner Mihaere Drive and Mako Mako Road, Palmerston North”. The Australian UNITE union organised several protests in Melbourne outside Woolworths stores which included fundraising and leaflets encouraging a boycott of Australian Woolworths stores. A large march through the suburb of Mangere (where the Auckland distribution centre was located) also took place, which was seen as an opportunity for the distribution centre workers to thank the local community for their extensive support throughout the lockout. Unofficial action was taken by wharfies in New Zealand and Australia, slowing down the unloading of goods destined for Progressive Enterprises supermarkets. The Maritime Union of New Zealand (MUNZ) threatened to blacklist (i.e. : refuse to unload) Progressive cargo entirely, however the lockout finished before they implemented this threat. Overall, NDU researcher Joe Hendren stated that Progressive may have lost over $15 million during the lockout. Vitally, a huge fundraising effort was also undertaken on both sides of the Tasman. At picket lines, collections in areas with high foot traffic, at public meetings and on protest marches, collection buckets were ever present and received high levels of donations from the public – as an example, four supporters were able to collect $1000 in just an hour during peak time at the Wellington train station. The NDU set up an 0900 number which could be called to make an automatic $20 donation. MUNZ members agreed to donate an hour of pay each every week until the lockout was ended, while many other unions made donations, including 3 Australian transport sector unions and Change To Win, an American union federation. In Palmerston North, the local branch of the Association of University Staff created an adopt-a-family scheme in which members would be assigned to a locked-out worker and their family to support them directly. Additionally, food was often taken directly to picket lines. By the end of September, over $400,000 had been raised for the lockout fund, not counting donations of food or other materials. This support was vital to enable the workers to survive financially during the dispute, to ensure they could still pay their rent/mortgages and feed themselves and their families. Anarchists took part in nearly all of the actions listed in the section above. In Auckland, two anarchists were also organisers for the NDU (and one of them was amongst the 10 arrested in the incident mentioned earlier). Other anarchists, most notably members of Radical Youth, an organisation made up of predominantly high-school aged people, also spent many hours on the picket lines and engaging in flying pickets. Wellington anarchists, without a local distribution centre, engaged in fundraising, picketing a makeshift distribution centre in Lower Hutt (which saw 3 arrested for blocking a truck) and some also travelled up to Palmerston North to support the picket there. Christchurch anarchists were involved in setting up a support group for the locked out workers with other radicals, which helped to coordinate flying pickets, fundraising and a march, in addition to helping to picket the distribution centre. In other areas without a distribution centre, including Dunedin and the East Cape, anarchists were involved in fundraising and pickets of makeshift distribution centres. However, outside of postings on Aotearoa Indymedia, communication between radicals involved in supporting the struggle was virtually non-existent, and thus no coordinated nationwide support campaign was engaged in by anarchists or the wider radical community. I was lucky enough to be travelling from Auckland to Christchurch via Wellington at the time of the lockout and participated in support actions in all three main centres, and in this I was able to see some massive differences in the activity undertaken, and some issues with some of the things anarchists did. I have used this experience in writing this article, to begin to raise some ideas that I hope will improve the effectiveness and efficiency of anarchist support for industrial actions that take place in the future, and our fight for a better society. Perhaps the key plank of anarchist theory on struggle is that of self-organisation, that the struggle must always be controlled by those directly affected by it. In a case like the Progressive lockout, that obviously means those workers locked out by Progressive Enterprises. In some cases, however, rather than taking our lead from the locked out workers, some anarchists advocated taking the lead from union officials. In one example, anarchists from Wellington had an argument on a private email list (which I therefore won't reproduce here) over whether or not attempts should be made to block trucks at a makeshift distribution centre in Lower Hutt – a move which had been called for by workers (and acted upon by workers, union officials and supporters in both Auckland and Christchurch) but had been directly opposed by the Palmerston North NDU official. In the end, some anarchists made the decision to blockade, which led to three being arrested (and, unfortunately, failed to stop the trucks). Perhaps nowhere was the distinction between the workers and union officials made more apparent than at the conclusion of the dispute. During what were to be the final set of negotiations, on September 21st, the delegated negotiations team (made up of locked-out workers) was asked to leave, and the negotiations continued with just the higher-ups from Progressive Enterprises and the NDU remaining in the room. Once agreement was reached between the two sides, the proposed agreement was not circulated to union members, but rather they were not to find out the details until the next day, when they had to immediately afterwards vote for or against ratification. The Christchurch workers almost voted it down – with only 51% agreeing to sign in the end, despite them having the largest pay increase of all 3 sites in the proposed agreement. They were so angry with the agreement that they decided to vote not to return to work the next day (a Friday), but to instead take another day off. In the end, at all 3 sites, workers marched back in en masse on Friday morning only to immediately leave again. In Christchurch and Auckland actions were then taken in solidarity with fellow NDU members working at Feltex carpets (who had lost their jobs after the company was put into receivership). In Auckland, Progressive workers held a protest outside a branch of ANZ bank, who had started the receivership proceedings, while Christchurch workers marched to the Feltex site and joined the workers there in a wildcat occupation of the factory premises. It is important to recognise the difference between workers and the officials who claim to represent them. While many union officials may be personally supportive of particular forms of action, they are constrained by both the law and their role as mediators between capital and workers, and therefore, in periods of heightened struggle, will inevitably be forced either to take a position more conservative than the workers whose dues pay their salaries or to abandon their job. One major problem was the lack of actual conversation between the locked-out workers and many of the anarchists who joined them on the picket lines. For obvious reasons, this was a major issue in Wellington (where the nearest distribution centre was several hours away in Palmerston North) and for anarchists in the smaller centres such as Dunedin, but it was also an issue for some anarchists in Auckland and Christchurch. In a situation such as this, where the workers knew each other well, it was always going to be hard coming in from the outside, to make any real connections. Regardless, there were some anarchists on picket lines who made no effort whatsoever to talk to anyone outside of the other anarchists on the picket lines. Perhaps at a one-off this would be understandable, but in a prolonged struggle such as this, where many anarchists spent hours, or even days, on the lines, this is a massive flaw. It is only through building real connections that we can have hope to maintain actual ongoing contact with those present. Rather than parachuting in, supporting a struggle then running off to the next big thing, we need to be trying to build connections with other fights, to help broaden the class struggle, not to assist in its atomisation. In creating these relationships, we also need to be honest about who we are and why we're there. That doesn't mean we need to introduce ourselves with “Hi, I'm Asher, and I'm a member of the Aotearoa Workers Solidarity Movement, an anarchist-communist organisation working towards a global revolution which will see the destruction of the ruling class, and indeed all classes, and the replacement of capital and state with a federation of workplace and community councils where all who are affected by a decision play an equal role in making that decision in a world without money or borders.” But it does mean that we shouldn't be ashamed of our politics, or the organisations we are involved with, we shouldn't hide them away. Surely if we are ashamed of our beliefs or the groups we are involved in, we should be questioning why we hold them or why we're involved. Currently, if people have even heard of anarchism, they generally have a bad impression (black bloc and/or bombs, for example). The easiest way to change that is to change those associations – if we're standing alongside someone on a picket line, if we're supporting them, and they know we are anarchists, then at worst they'll think “oh, I guess there's at least one anarchist who isn't a complete idiot” and at best, they may even question some of the assumptions they held about what anarchism is. If we are ever to restore the long-lost connection between anarchism and the idea of working class solidarity in people's minds, we need to start openly being known as anarchists when we engage in acts of working class solidarity. Obviously everything I've written here is easier said than done – 5 years on, and I can't even remember the names of any of those I stood alongside, stared down trucks and shared countless cigarettes with. But it is these relationships forged in struggle that are key towards being able to move from the defensive to the offensive in our fight to create a new world. Struggle changes people, as shown by the willingness of Progressive workers to take action in solidarity with their fellow unionists at Feltex. As radicals, as anarchists, we need to stop isolating ourselves, to recognise that we don't have all the answers. I have no doubt that I learnt far, far more from the locked-out Progressive workers than they learnt from me. I feel genuinely lucky to have spent those weeks in 3 different cities playing my tiny part in helping to support them in their fight. Politically, participating made me fundamentally question a lot, especially around how we as anarchists interacted with the rest of society. It made me relearn the importance of class struggle and the potential power that we have as a class after 2 years of involvement in the Wellington activist scene had had me focussed on protest politics and individual action. It helped me realise that even in our seemingly depoliticised society, people were still willing to stand up and fight, and even more people were willing to support them however they could. I think back to the dairy owner dropping off a carton of cigarettes at the Mangere picket line, the white-collar worker going to an ATM and getting money out specifically so he had something to donate to our collection at the Wellington Railway Station, the teenager who turned back at the supermarket door after hearing why we were standing outside it. 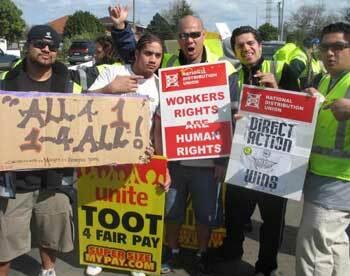 5 years on, I still have photos from the Mangere picket line on my bedroom wall. They inspire me, and serve as a constant reminder of the power of the politics of everyday life. A politics which focusses on our lives and the issues which affect us day to day, not another protest against a faceless meeting of international figures. A politics which connects us to our workmates or our neighbours, not one which merely relieves our guilt and causes us to look down on those less enlightened. If there is one lesson I took from the Progressive lockout that I hope all anarchists can take on board, it is that. Never underestimate the ability of working class people to organise, to agitate, to fight and to educate. We are the largest force in this society, and it is only when we learn to fight collectively that we will ever be able to have a chance to defeat capital once and for all. It is simply not good enough for those of us who self-describe as anarchist or radical to assume we have the answers, or that we alone, by sheer force of will (or arms), can overthrow capital and state. If we are ever to have a chance at creating the sort of society we dream of, it has to be together with our class, the working class. We need to organise, not just with other anarchists to support others struggles (though that is also important), but with our workmates to improve our wages and conditions, with our neighbours to improve the state of our communities, and so on. We need to move from seeing class struggle as something that workers do, that we support, to seeing it as something that we do, as workers. We are not apart from the class, we are a part of it. This article was written for an upcoming edition of Imminent Rebellion, a New Zealand anarchist journal to be published by Rebel Press. Cheers for posting this, great article, and very interesting. I hadn't heard of this strike/lockout before. I think there are parallels between some things you talk about here, and the Visteon occupation in Enfield recently. Especially around the idea of hiding our politics, which is something we should think about for the future.